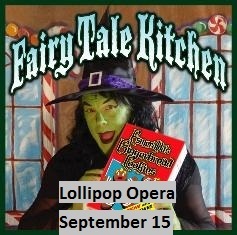 On Saturday, September 15 at 2PM, United Methodist Church of Hartford will present a performance of FAIRY TALE KITCHEN, an original interactive children’s operetta performed by Lollipop Opera. Even adults will enjoy the fun as “reformed” witch, Esmeralda (John Swanson, baritone), attempts to film her TV cooking show despite the constant interuptions of her fairy tale neighbors (Deanna K. Swanson, soprano, and Julie Rumbold, mezzo-soprano). Little Red Riding Hood, Cinderella, Snow White, and Hansel and Gretel are only a few of the old friends you’ll meet again. Some characters will even be played by children selected from the audience, and everyone will have the chance to participate. Lollipop Opera is a Connecticut based touring group that brings the excitement of live theater to children with fully staged opera programs, complete with beautiful sets and costumes. The goal of Lollipop Opera is to expand the horizons of children through exposure to the arts. Children will learn that opera is a true marriage of artforms, incorporating music, acting, and visual arts. Another thing they’ll learn is that opera can be a whole lot of fun! Come, join the fun at this special community performance. Tickets cost $5 for children and $10 for adults. You can PURCHASE TICKETS at our Donate Online site. Just fill in the amount you owe in the Lollipop Opera line, let us know in the notes box how many adult and children's tickets you are buying, and proceed to payment with either your credit card or PayPal account. Your tickets will then be available at the Will Call area on the day of the performance. If you have any questions, please call Steve at 860-670-2777.